Charles Martin Hall, an 1885 graduate of Oberlin College, discovered that globules of aluminum could be produced by passing direct electricity through a molten mixture of cryolite and alumina. Aluminum quickly became the second most widely-used metal and Hall became one of the few inventors to capitalize on his invention by retaining a lifelong involvement in the management of the Aluminum Corporation of America. Hall's initial discovery was made in February 1886 in a shed behind his home, shown here. Hall donated his home to Oberlin College at his death in 1914. It still stands on the corner of College and Pleasant Streets. The photograph is 8" x 10" (20.3 x 25.4 cm). It is part of an extensive collection of photographs of Oberlin and Oberlin College at the Oberlin College Archives. John Jay Shipherd settled Oberlin in 1833. Shipherd, a pastor at the First Presbyterian Church in Elyria, was discouraged by his congregation's disregard for his insistence on abstinence from alcoholic beverages and strict adherence to religious doctrine. 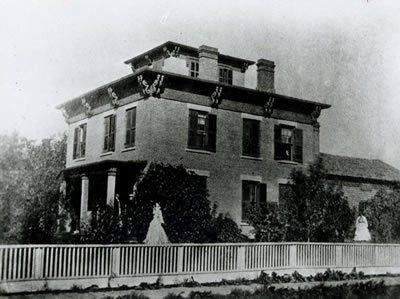 Along with his friend Philo P. Stewart, Shipherd purchased the land to the southwest of Elyria from its Connecticut owners to start a school where his religious ideals could be realized. They named the community Oberlin after minister John Frederic Oberlin. The Collegiate Institute established by Shipherd and Stewart had financial difficulties until Shipherd invited the anti-slavery radicals from Lane Seminary to the school. With them came the hiring of revivalist minister Asa Mahan as President, theologian Charles G. Finney as head of theological department, and a generous promise of financial support from New York merchants Arthur and Lewis Tappan. The Institute was divided, however, over the condition that the school must allow the admission of African-American students. A 5-4 decision by the Board of Trustees accepted the Lane Radicals' proposal to admit African Americans. Oberlin then became known as an abolitionist stronghold. In 1837 it conquered another barrier by offering A.B. degrees to women. Oberlin College Archives Record Group 32 from the Photographs Collection.